As a church family, we have much to be thankful for. Here is some of what was shared on Wednesday evening last week, as we gave thanks to God together for His amazing kindness to us in Christ Jesus. So thankful for the trials in our lives that have drawn us, as a family, closer to Christ. My health issues have been overwhelming at times and yet God continues to be faithfully beside me, healing me and providing. God has been so faithful through my trial of cancer this past year. The body was so amazing in supporting both me and my family. Surrounding us with love and compassion. Through this trial, I have been able to minister to other women who are now facing cancer. It is pure joy to share with them how my faith and hope reside in my great Almighty God! I can’t wait for heaven, where I will get a new glorified whole body. I am thankful to love my family, to follow Christ to be saved, and that Jesus is always forever the same. I am thankful for FBC, that the thoroughness of the gospel is taught and lived out. And for people here who go to the Word to instruct and help me when I need it. I am thankful for my priorities, friends and family. I am thankful for food, water, house and clothes. And I am really thankful for FBC for teaching me about the God, Lord, Holy Spirit and the gospel. And for teaching me tons and tons of memory verses. My favorite verse is Romans 10:17, “faith comes by hearing and hearing comes from the Word of God.” I say that every day to myself. I am thankful to God for His word being taught so faithfully here. I am thankful for the practical ways the gospel is needed in parenting…… God shows me that the Gospel is always needed in my heart and to be lived out by me first!! I am thankful to God for my family and seeing us grow closer to God. Thankful how God has shown us that when we put our complete trust in Him how it all works out. I am thankful God is giving my father strength while he is dealing with cancer and his final exams in law school. I am thankful God is giving me hope and not making him too distraught. I am thankful God is keeping my grandparents safe on their motorcycles. I went through a period of time when I dealt with bullying by others, and the deaths of family members. I am thankful the Lord helped me get through the storm. Also I am thankful for God helping me deal with my parents and my current problems. I am thankful for God. I am thankful for my family, our RMG and God. I am thankful for all the trials in my life that have brought me closer to God as a result. I am thankful for, first and foremost, God removing the scales from my eyes so I could join His family by seeing His truth by His guidance. If I had a thousand tongues, I still could not thank Him enough for saving me. 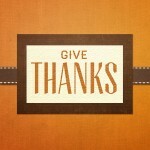 I am also thankful for my wife, kids, FBC and its leadership, for my job and for our friends and family. I am thankful for a God that changes the lives of people. I have seen growth in so many people this year and it is awesome! I am thankful for a church that upholds truth at all costs. I am thankful for my health and for pain-free days, after over a year and a half of illness and pain. I am not sick or in pain, but most all, I am thankful that He was with me through it all. I am thankful for the body of Christ and that I get to praise God with them forever in the presence of God in Heaven! I am giving thanks to God and praising Him forever for His giving love. I will always love Him… I LOVE GOD!! I am thankful for FBC and everyone that comes. I am thankful for my family, but I am most thankful for God’s Love. It is the best thing that you can get. I am thankful for my brothers, because they have changed my whole life and family. I am thankful for God and mommy and daddy. I am most thankful today for the first day of being with my husband in months, and its such a blessing to be in church and to reconnect with the body. I am thankful for my part-time work , a working car, a bed and a roof over our heads. Small everyday comforts are a blessing when they haven’t always been there and their absence has brought me closer to God! I am grateful for the great pastors and staff at Faith Bible. Keep chasing after Jesus!! I am so thankful the Lord has been working on my heart by revealing what a prideful person I am. The trials have made me dependent on Him in a way that has brought me to my knees. Even as there seems to be no eand to the trials, I am counting it all JOY for the building of my character! And thankful for the new baby boy coming soon! I am thankful for the safe delivery of our son almost 8 weeks ago, and for the Lord sustaining me through his week-long stay in the NICU. God grew my husband and I through that experience, bringing us to a place where we had nothing but Him. It was a long week, but at the end we were able to say that Christ alone brought us through. I am thankful for my family who is so giving, and our wonderful RMG for discipling and giving me and challenging me to be more like Christ. I am thankful for Gods grace in my life. God has provided a job after 4 months of unemployment, continued health during time of unemployment, I am Thankful for FBC’s boldness to continue to preach the Word week after week unashamedly. I am thankful that God is much smarter that I am, even when I don’t understand my circumstances because He is always faithful. We have MUCH indeed to be thankful for! Plan ahead now to join us next Thanksgiving Eve for another wonderful evening of giving thanks to God together as a church family.